It sounds typical. A small startup launches a Kickstarter project that achieves funding in record time. Kytelabs is not only the new startup that has achieved funding in this story, but is distinguished as one of the fastest growing hardware campaigns on Kickstarter. In June, they launched the BLEduino project, bucking the status quo and turning their passion for making people’s lives easier and more enjoyable into an open source hardware company that is starting something of a hardware renaissance and drawing more attention to a small island in the Caribbean. Kytelabs is based in Caugus, Puerto Rico. It’s three founders, Jonathan Gonzalez, Ramon Gonzalez and Angel Viera all attended the University of Puerto Rico, Mayaguez. Instead of taking six figure salary jobs, they decided open source hardware was the way to go. In particular, open source hardware based on other open source hardware. Their aim, however, is to make it dead easy to control devices using a mobile phone and Bluetooth. They struck a cord with the open source, hardware hungry community, reaching their $15,000 goal in 52 hours, going on to hit stretch goal one of $30,000 and coming up on stretch goal two of $60k with nearly 1,000 backers. It’s a testament to the talent and community coming out of Puerto Rico, as well as the reach they have through sites like Kickstarter. 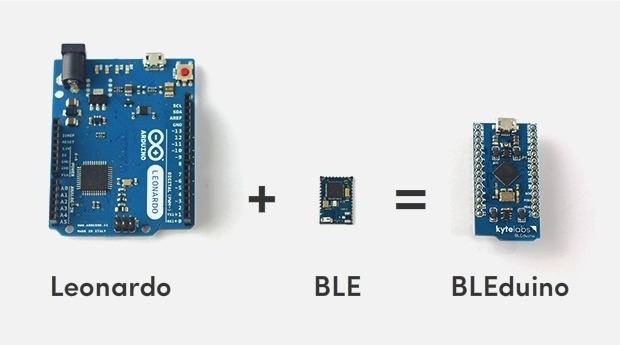 But what makes BLEduino so special? The BLEdino is similar to other open source hardware initiatives aimed at improving upon the Arduino electronic prototyping platform. 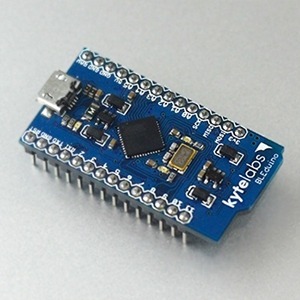 Instead of integrated wi-fi however, they introduce integrated Bluetooth Low Energy (BLE), hence the name BLEduino. It’s also super compact, measuring at a mere 0.9″ x 1.7″, but retains complete compatibility with Arduino hardware and software. It’s also completely open source from the schematics and firmware to the iPhone app (and soon Android app) that comes with the board. 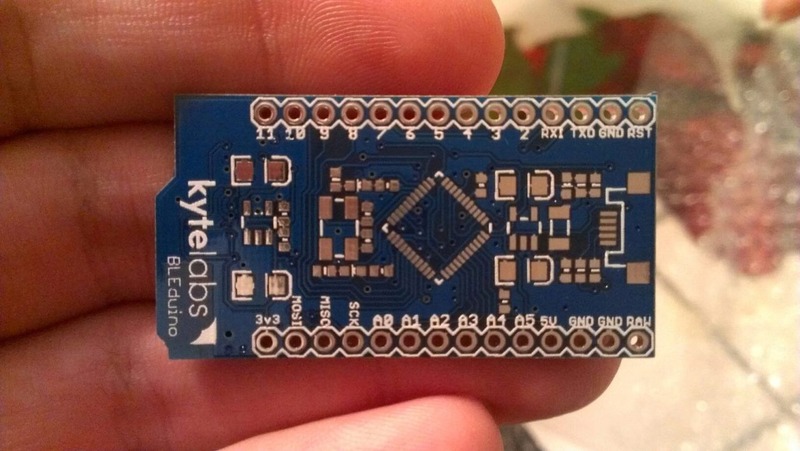 Jonathan Gonzalez, founder and CEO of Kytelabs explains to us exactly what the BLEduino does and what it does differently. The BLEduino concept came out of a need we saw in the market for a new Arduino board that made it super easy to control things from your phone via Bluetooth 4.0, but still retained the properties and features you love about Arduino. We wanted our board to be cheap, small, and compatible with Arduino shields. To do this, we shrunk down an Arduino Leonardo, added Bluetooth 4.0 to it, and created a Shield-Shield that allows you to make our board compatible with Arduino UNO and Arduino Leonardo shields. Bundled with the BLEduino is a really awesome all-in-one iPhone app (and soon Android app) that allows you to control all of your experiments from the same app, in the form of modules. In other words, you don’t need to be an iPhone developer to experiment and do incredible things with the BLEduino. And of course, all of our work is fully open source, including the iPhone app and the schematics. Now, there are other boards out there that allow you to control things from you phone, but ours is different in a few key areas. For starters, the BLEduino is based on the Arduino Leonardo, meaning your code is almost guaranteed to work and you can do keyboard and mouse emulation right out of the box (as seen in our video). Also, we expose a lot of pins meaning you can do more things with the same board. Our Shield-Shield is also the most advanced we’ve seen on the market allowing the BLEduino to be backwards and forwards compatible with current Arduino Shields. You can control relays, robots, LED’s, use it as a game controller or keyboard, automate your home, set it up with your phone to receive notifications and apparently they’ve even figured out a way to peel a banana with the BLEduino. They’ll be releasing a video shortly on that last one. We will of course update the post with that as we know how important and necessary something like that may be. You have but a few days left to get in on the BLEduino revolution yourself. 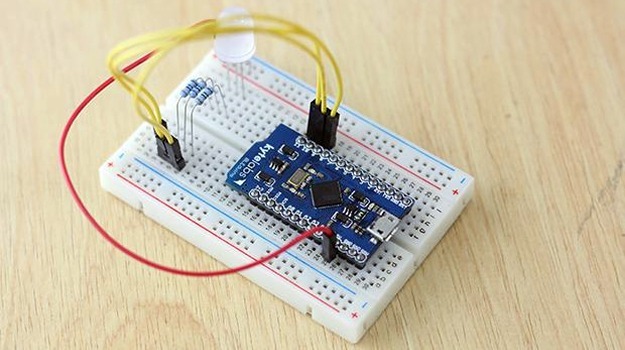 They have several great packages that include everything from the simple BLEduino ($34) to a Mad Scientist Kit If you’re new to electronics, The Maker Kit ($99) gets you a BLEduino, a Shield+Shield, breadboard, wires and a whole lot of components. The campaign ends July 21st, with stretch goals still in sight and free shipping to the USA.